Busy planning your next African safari? Or thinking about a safari for the first time? East Africa’s mainstream safari destinations are accessed via Nairobi into Kenya and Tanzania. This is where the annual wildebeest migration plays out on centre stage within the Serengeti-Masai Mara ecosystems. It’s the “greatest show on earth”. So get it right and you’ll encounter great masses of wildebeest, zebra and antelope. Also with a healthy dose of big game and predators in action. If you get it wrong you’ll be in the company of safari crowds being treated to an outdoor circus act. There’s no need for that in a region the size of Western Europe! Southern Africa’s traditional holiday haunts favour South Africa. You’ll find immense cultural diversity across the country. Also Africa’s best metropolis, Cape Town. Enjoy fine dining and first class wines. Also cold beers and BBQ’s (we call them braais) enjoyed African style. You’ll also find a wide selection of safari options within a multitude of game parks through South Africa. The best use of Johannesburg is to get out into the wilder hinterlands of Botswana, Zimbabwe, Zambia and Namibia! Because this is where you’ll find greater habitat diversity, breathtaking outdoor vistas and immense populations of big game. So we use Victoria Falls as our “safari hub” in southern Africa. Importantly your going to find fewer crowds in the right places too. Central Africa is reserved for intrepid, generally well-seasoned and well-heeled adventurers. You’ll find a few safari gems in Gabon, the Central African Republic and Congo. East Africa’s annual migration is driven by the availability of fresh grazing and water which shifts as the rainy seasons pass through the year. We have a short and “shallow” rain in November, a long and “deep” rain from March to May. So the East African safari season is at its peak in Tanzania from December to March. Then again across the entire eco-system in Tanzania, Kenya, Uganda and Rwanda from June to October. Excluding the “Mediterranean” climate in the Cape, southern Africa has 3 main seasons. A wet and warm summer from November to April, a cool and dry winter during May and June with a hot and dry safari season from July to October. Migrant birds flock into the southern hemisphere’s summer between September and April. Also wildlife tends to concentrate in valleys and on river courses during the dry periods. So the end of season from September until the start of the rains in November is prime time! This applies in East, Central and Southern Africa. We strongly recommend these notes on our secret seasons in Africa. 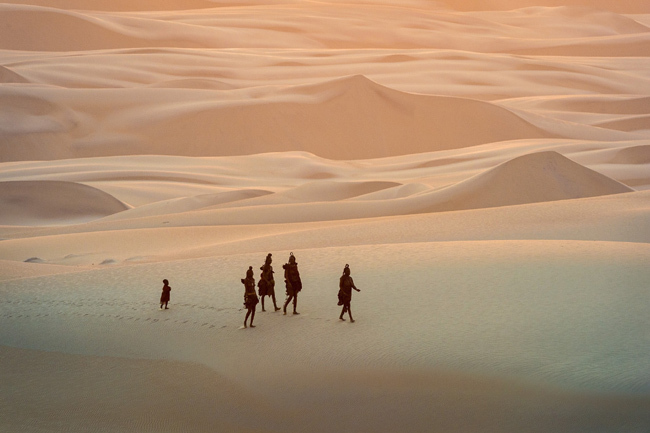 It doesn’t matter whether your interest is wild migrations or big game or perhaps the pursuit of rare species or unique landscapes or special cultures. We’ll consistently point you in the direction of remote places with no crowds. The surest guarantee of an extraordinary safari experience in these wilder places is in the company of Africa’s top guides. This is what makes the difference on an African safari. Safety always comes first and creature comforts can be taken for granted wherever we go. Equally important you’ll meet some big personalities who’ve dedicated their lives to conservation, ecology and natural history. They’re passionate, inspirational and knowledgeable individuals who’ll share a great zest for life. They invariably sport wicked senses of humour as well. Finally don’t expect to lose weight or to get a lot of sleep on safari. We assure that you’ll come away with new friendships in addition to great stories and memories that’ll raise smiles for years to come. The annual migration is an irregular clockwise movement of approximately 1.5 million wildebeest, gazelle and zebra around the larger Serengeti eco-system. To catch the action you need to look at Tanzania’s Serengeti or Kenya’s Masai Mara at any time of year except April and May when the “long” and deep rains have set in. Main access is via Nairobi (Kenya), Arusha or Dar es Salaam (Tanzania) and to keep costs in check you ought to concentrate on one or the other…. Tanzania’s northern circuit (Serengeti, Ngorongoro, Tarangire, and Manyara) is best for the migration from January to April in the southern Serengeti. Again from August to November in the north. Beyond the migration you’ll find outstanding wildlife with resident big game in the south and west of the country (Selous, Ruaha, Katavi, and Mahale). Some good beach options on Zanzibar and Pemba. 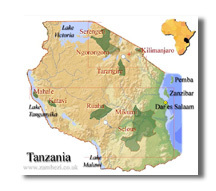 If you’re after wildlife, volume and variety then Tanzania is a better choice than Kenya. Kenya‘s Masai Mara is at its best for the migration from July to October. Ideally combined with other more diverse habitats (Amboseli, Laikipia, Meru, the Northern Frontier District and the Rift Valley). Then the beach spots around Lamu and Malindi. If wildlife is an interest and you’re also interested in culture and a beach break then Kenya’s a better bet than Tanzania. Here’re some important guidelines on how to plan a migration safari. If planning a safari/beach combination then August/September is better for wildlife, February/March is better for beaches. The one rule for East Africa is that the remote options are where you’re likely to avoid crowds. Also have access to the best guides. When the migration is “on”, space is at a premium and advance bookings are essential. Southern Africa has loads of diversity and excellent wildlife with a range of safaris to suit all tastes and budgets. Unlike East Africa, the southern region is suitable for travel year round. The main safari season runs from May to October with game conditions improving steadily as the season progresses. During the summer peak we have a “green season” from November to April with most rain falling in February/March. Johannesburg is the main international hub and the iconic Victoria Falls offers simple access into the wilder safari regions. Zambia: Arguably southern Africa’s best safari spot. With exceptional wildlife in the Luangwa and Lower Zambezi valleys. It’s renowned for walking safaris with some of Africa’s top guides. Zimbabwe: Home to many of the continent’s best professional guides. It’s especially rewarding for big game and predators in Hwange and the lower Zambezi valley. Walking and canoe safaris are our favoured safari modes. Zimbabwe is safe too! Botswana: Traditionally known as southern Africa’s most exclusive safari destination with the best wildlife in the Moremi and Chobe. Relatively high prices keep the crowds at bay. Botswana offers excellent “green season” value from December to March. Namibia: Wildlife in Etosha is excellent. But the real attraction is dramatic and rugged landscapes. Especially in the remote spots within the Namib Desert or on the northerly border along the Kunene River. Best done on a self-drive basis especially if you have time on your hands. South Africa: Very easy, fairly tame and best in Africa for variety.  Offers easy international access and simple routes to wilder safari destinations further north. Birding: Go anywhere from November to April! Uganda, Gabon, Tanzania, Zambia, Botswana and South Africa offer amongst the best safari habitats for birders. Absolute best is late October to mid-December. Gorilla treks and safaris: Permits for mountain gorillas in Uganda and Rwanda are easy. Lowland gorillas in Gabon need time and patience, also tolerance. Options in CAR and Congo are good and as yet not mainstream. Doable at any time of year. Chimps: Kibale in Uganda, Mahale in Tanzania offer totally different experiences. Any time of year. Expect some tough tracking in June and January. Big game: Aim for the Luangwa, Mana Pools, Hwange, Moremi, Linyanti, Chobe, Katavi, Selous, Ruaha. The largest congregations are found in October. Lions: Visit the Lower Zambezi, Okavango and Linyanti from May to November. Also Queen Elizabeth NP’s Ishasha area for tree-climbing lions or Katavi’s Kapapa River in September to November. Try Kidepo Valley in north Uganda. Elephants: Mana Pools, Linyanti, Chobe, the Luangwa, Selous, Katavi, Amboseli. Wild dogs: Moremi and Linyanti in June. Selous in July and August. Especially good is South Luangwa during the green season. Cheetah: Go to Okavango/Linyanti, Namibia or Kenya’s Mara from June to October. The Serengeti’s Seronera is always good too. Wildebeest migration in East Africa. Use a mobile camp or take a walking safari and go late October or early November to the northern Serengeti. Also the southern Serengeti in January to March. Wildebeest migration in southern Africa: Go to Liuwa Plains in western Zambia in December, May or June. Also visit the Makgadikgadi Pans around March. Bats! Visit Zambia in November for the convergence of millions of “straw-coloured fruit bats” as they descend on Kasanka National Park. History and culture: Visit Ethiopia and the historical sites of Axum, Lalibela, Gondar and Bahir Dar. Alternatively explore Lamu or Stonetown for Swahili culture. Or explore some of South Africa’s recent past through battlefields and townships. Safari-Beach combinations: Go to Kenya or Cape Town in February and March. Zambia and Mozambique in September and October. Or Seychelles in May to September. Visit Madagascar in October or November. For fresh water beaches combine Katavi with Mahale or the Luangwa with Malawi between May and October. Active safaris: Canoe the lower Zambezi any time of year, but best June to early November. 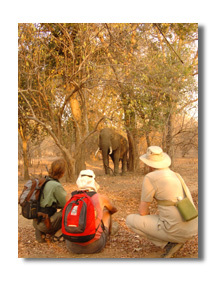 Take a walking safari in Mana Pools, the Luangwa or Selous between June and October. Go trekking in Ethiopia’s Simien Mountains or the Rwenzoris from Uganda. Educational encounters: Go to Victoria Falls to encounter orphan elephants. Do work as a chimp caregiver on Ngamba Island in Uganda. Spend some time anywhere in the company of the best guides. Family safaris: Get the kids active in the Kenyan bush and beaches. Or combine Victoria Falls with Botswana or Zambia. Take a malaria free safari to the Kruger and Cape. Secluded spots: Seek out some real gems in Tanzania’s western corridor. 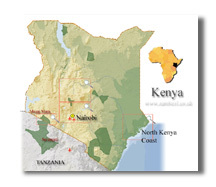 Venture further north on Kenya’s coast or the northern Frontier District. Visit the Kidepo Valley and Semliki in Uganda. Namibia’s Skeleton Coast and northern Kaokoveld offer rare safari experiences. By all means use mainstream destinations for easy and inexpensive access. It doesn’t matter whether you’re a first-timer or seasoned traveller. Always aim for the wild and remoter places for no crowds, best conditions and Africa’s top guides. Top ten African safari plans: A selection of top tried and tested safaris across East, southern and Central Africa. The best safaris in Africa: A full range of typical safaris with itineraries and prices. 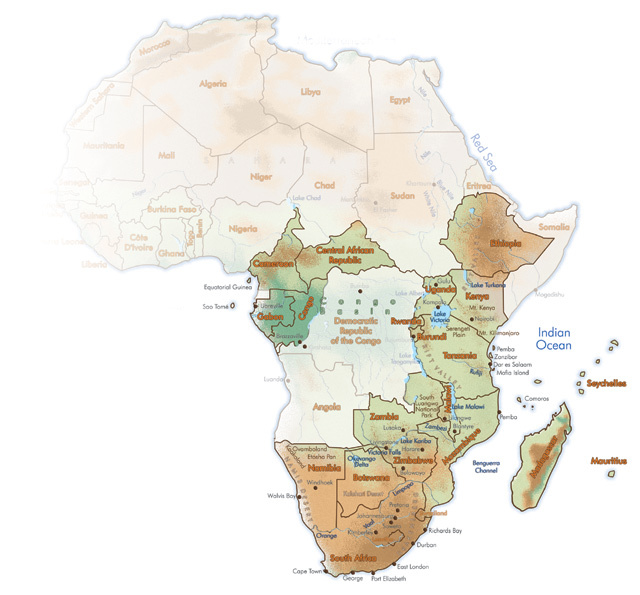 Where to go on safari in Africa: Map showing Africa’s best safari destinations.